Some years ago when Rev. Jesse Jackson was running for President I took his moto "Keep hope alive!" as my Advent theme. Hope is always needed in "this world of tears". Christians are people of hope. Today we surely need to be people who hold on to hope for others. 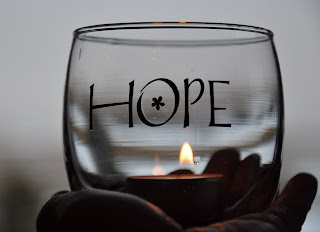 Many people are losing hope. Perhaps they have placed all their hopes on material things and because of the economic crisis they are now acutely aware that these things do not last. There may be others who are losing hope because of illness, addiction, anxiety or sinfulness. Christians must hold the light of hope for others, explaining why we are a people of hope - it is because of Christ.